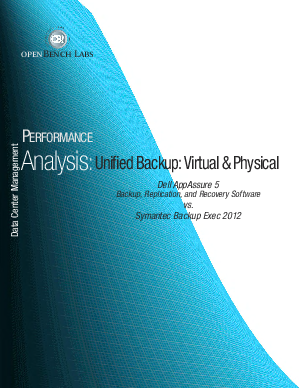 > Dell Software > Can One Backup Solution Do It All? In rigorous testing, openBench Labs found that Dell AppAssure 5Ô offered significant advantages in ease-of-use, backup speed and recovery time. “AppAssure’s incremental forever image-level backup technology can be set to execute every five minutes for 288 recovery points a day.” Read their complete findings: Unified Backup: Virtual & Physical.